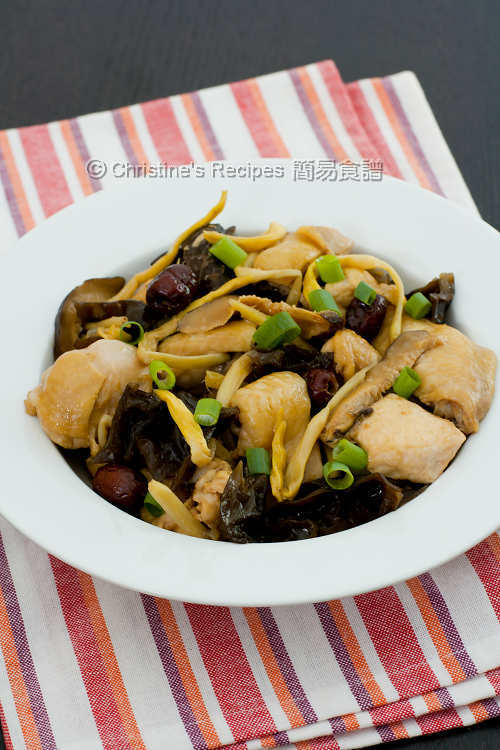 The wood ears and dried lily buds become the superstar of this steamed chicken dish because they absorb all the flavours of the sauce. Steamed chicken has been my most favourite dish cooked by my mother from childhood. Many young kids don’t like eating those foods in dark or black in colour. I and my daughter might be the odd ones. 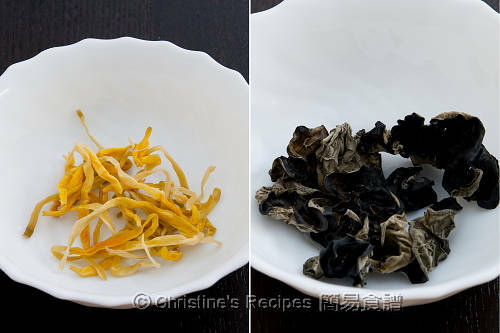 I love the black fungus, cloud ears and wood ears very much, especially steamed with chicken. Left: Dried Lily Buds. Right: Dried Wood Ears. The texture of cloud ears is so delicate and smooth, absorbed all the goodies of chicken after steaming. My daughter would pick all the cloud ears to eat and always complaints that she couldn’t have enough of them. Rinse the chicken and wipe dry with paper towels. Cut into smaller pieces. Mix well with the seasonings, cover and let it rest for about 20 minutes. 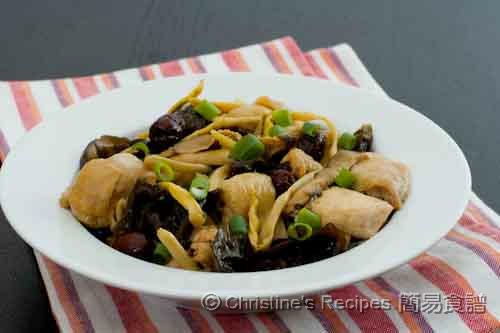 Soak the dried lily buds, cloud ears, dried red dates and mushrooms separately until softened. Blanch the lily buds and cloud ears in boiling water for about 2 minutes. Drain well. Remove any dirts of the cloud ears and trim into smaller pieces. Cut mushrooms into strips. Mix with the marinated chicken and add the ginger. Steam the chicken in a wok over high heat with a lid on, for about 20 minutes, or until cooked through. If no blood in the chicken, it’s done. Garnish with spring onion. Serve immediately. Dried wood ears will become 5 to 6 times bigger in size after being dehydrated. You might like to debone the chicken before cooking. As for Chinese traditional cooking, we like steamed chicken with bones. My hubby feels those chicken meat on bones more delicious than those off the bones. Very nutritious too with the woodear, red dates and mushrooms! I love such a homey tasty healthy dish anytime! LOVE it! Your photos are really gorgeous too! They make the dish so appetising... Btw I've bookmarked this recipe because I'm always keen on simple to do recipes, perfect to whip up on a busy weeknight. Also, steaming is one of my fav cooking methods because it's so clean and all I need to do is dump everything in, leave it there and wait for it to be cooked. I'm a really lazy cook, see =) Thanks again! I like steamed chicken too, healthy and delicious. I always have dried woodear etc in the pantry in case I am low on fresh foods. is it cloud ear or wood ear as the ingredient says cloud ear? I used cloud ears this time. Actually, I sometimes use both wood ears and cloud ears to make this dish. Sorry for confusing you. I cooked an around 1 kg free range chicken (almost double) cut into small pieces (bones included) but add the marinade by 50% only except for the soy sauce, omit the salt and add about 50ml of water. Sorry to hear that. I've tried this recipe not only once though. Just wondering if the brands of soy sauce, oyster sauce and dark soy sauce you used were saltier than mine. Try to source some with low-sodium products. Thank you for all your wonderful recipes. With your recipes, I am impressing everyone with my cooking. Ohhh! So glad you shared this - reminds me of Chinese Nutrition Class! YUM! My mum used to cook this dish for us. I grew up with it. Are the Cloud Ears called Bai Mu Er? white wood ear? Cloud Ears are called 木耳 (mu er) in Chinese. I often use 白背木耳 (Bai bei mu er). Bai Mu Er is different. Made this for dinner. Sooo incredibly delicious! Even my picky son loved it! Thank you so much for this easy delicious recipe! It’s a keeper! So happy for you Thanks for letting me know. Happy cooking !